The forecast predicted rain during the night. 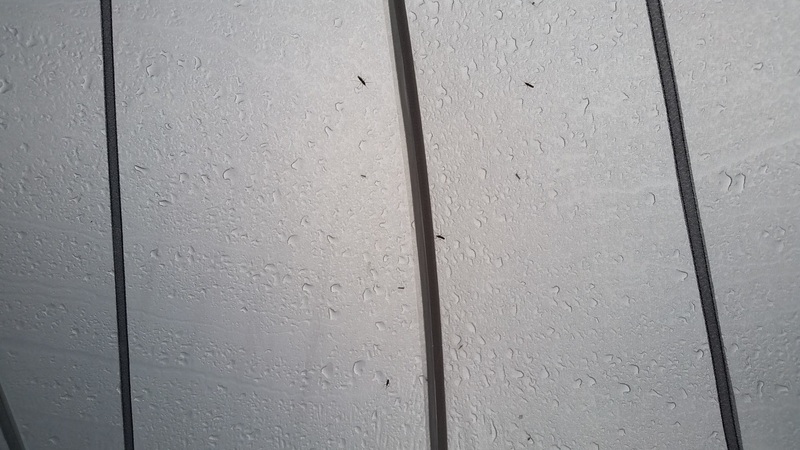 We didn’t have rain but there were many small rodents scurrying around outside our tent. Laurie kept waking up thinking mice were chewing through the tent. Luckily in the morning there were no holes, just tired humans. We had agreed on a 6am departure time unless it was pouring. At 5:30 am the rain started. Man! We were so close to being able to put away a dry tent. Thankfully it was only sprinkling. We headed out of camp dressed in our rain pants and rain coats. It was a wet morning. The first 2 miles we walked through multiple lava fields. The trail was a distinct red color in comparison to the dark volcanic rocks. 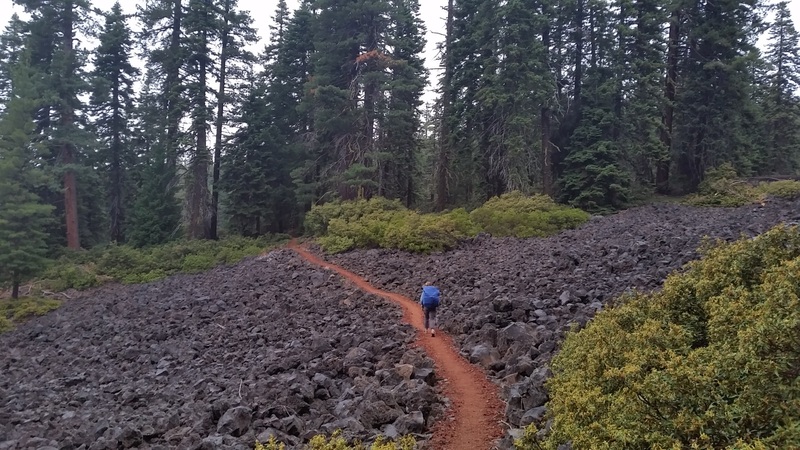 It felt like we were following the yellow brick road – although in our case it was the red lava rock trail. The rocks were sharp but our feet were fresh. 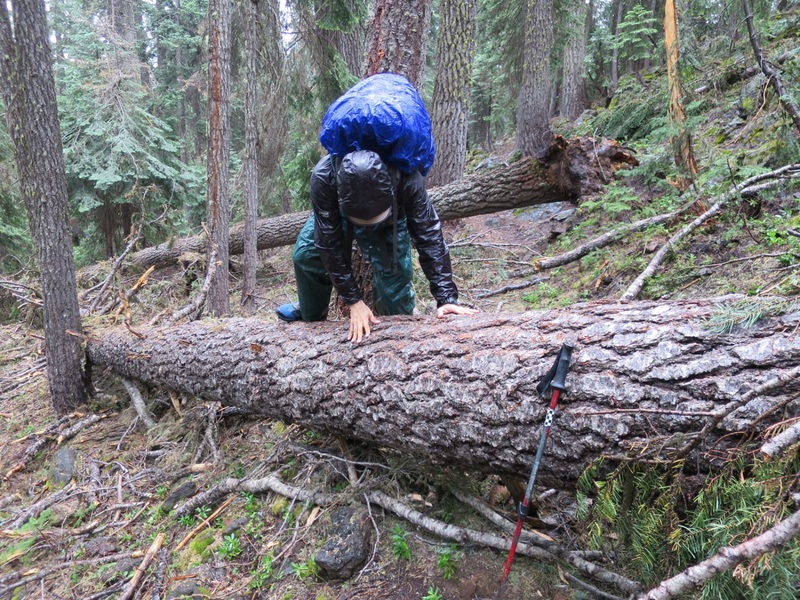 Our first major obstacle was a large down tree across the rocky trail. The diameter of the trunk was at least 4 feet wide. Luckily a branch had broken off so we used that to push off and vault over the trunk. This was a little foreshadowing of what was to come. Within 30 minutes of leaving camp our feet were soaked. The rain came down steadily and plants donated their wetness as we brushed past. Despite all of our raingear, after a few hours we were soggy and wet throughout. Not even our bellybutton were dry. Even though we were wet and uncomfortable, we made an effort to appreciate the beauty around us. The air smelled like damp earth, rich and full of life. 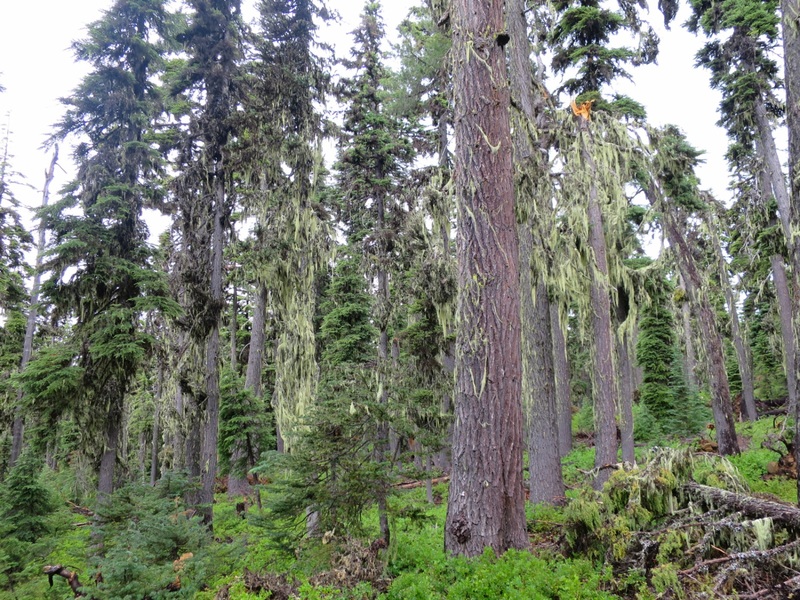 The wolf lichen glowed through the low hanging gray clouds. Just as we got to hwy 140, it started to pour. It was decision time. Speed suggested we hitch 2 miles, get a cabin at Fish Lake and wait out the storm. While enticing, Laurie’s godmother was coming to meet us in Crater Lake and we wanted to maximize our time with her. 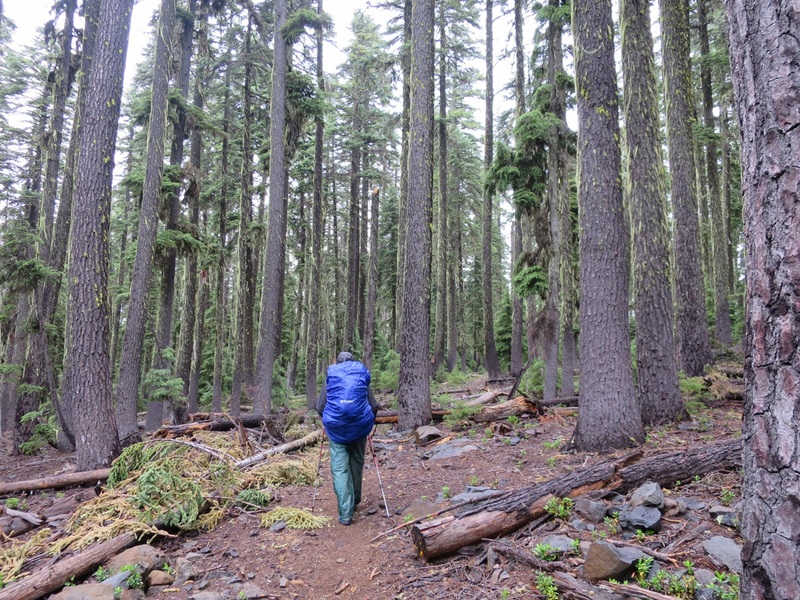 So we pushed on, into the rain and wet forest. Reluctantly Speed pushed on with us. He really doesn’t like hiking in all day rain but it is easier to endure the rain with company. Thankfully it wasn’t cold so as long as we were moving we were okay. About a half a mile after crossing a bridge over a fast flowing creek we encountered our first few blowdowns. 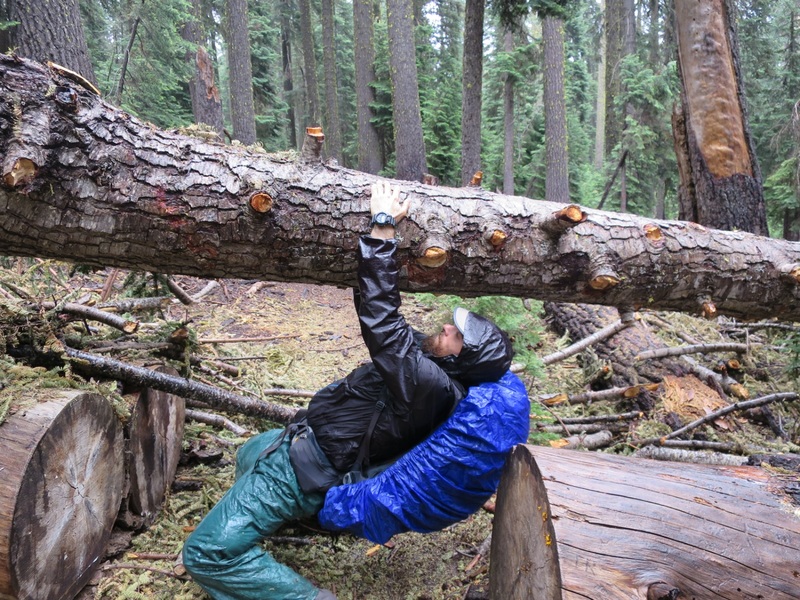 Our progress was slowed dramatically as we went over, under or around the logs. Andy started to count how many logs we stepped over or ducked under. We picked our way through the downed logs. The low lunges, hops and careful stepping was exhausting. 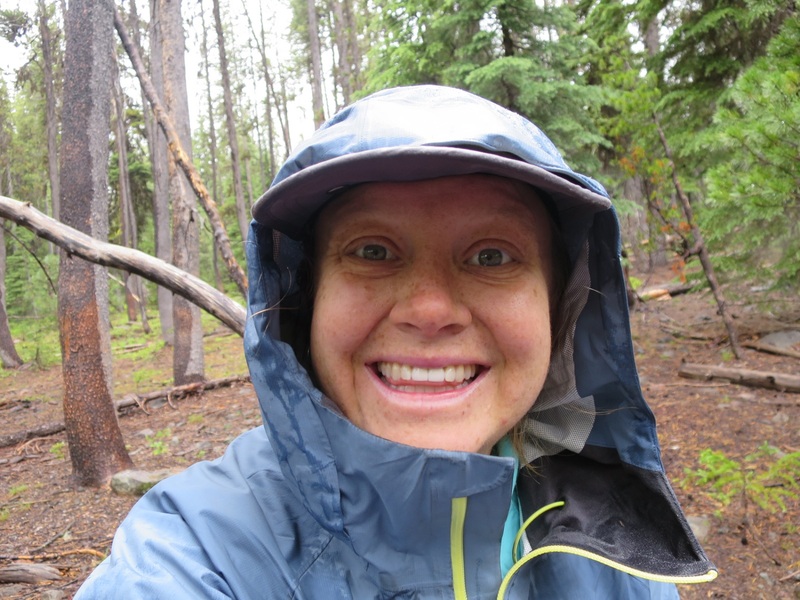 “If I weren’t wearing a backpack and knew I could take a hot shower tonight, this would be fun!” Remarked Laurie as she climbed over a tree trunk. Unfortunately neither was possible. We were wet and at least 40 miles from Crater Lake. So we kept going. “At least this isn’t boring” added Speed. It was like Parkour in the backcountry, although we were not as fast or as graceful as those athletes. Around 11:30am the rain let up so we stopped for an early lunch. Even with all the log crossings we knew we’d make it to camp early. Almost instantly the mosquitoes swarmed us. There were at least 50 of the buzzing buggers around each of us. Oregon is infamous for its mosquitoes, especially in July. We knew that but it is so much worse to experience it first hand. We hope it isn’t like this the entire state! After 15 minutes we were sick of the mosquitoes and the rain started up again. 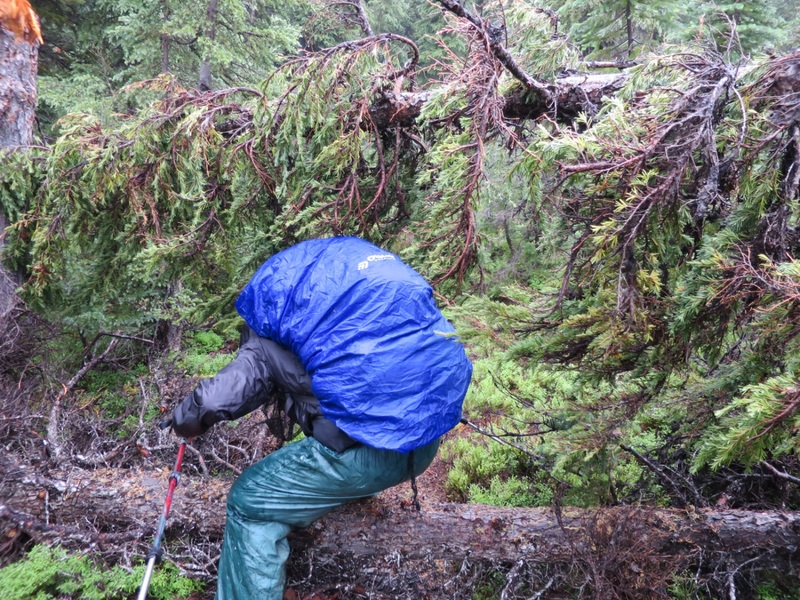 With headnets under our raincoat hoods and hats we continued walking through the maze of downed logs. The mosquitoes never let up, not even during stronger periods of rain. They didn’t hassle us too much as we walked, but if we stopped even a moment, they were all over us like Laurie near a pie! 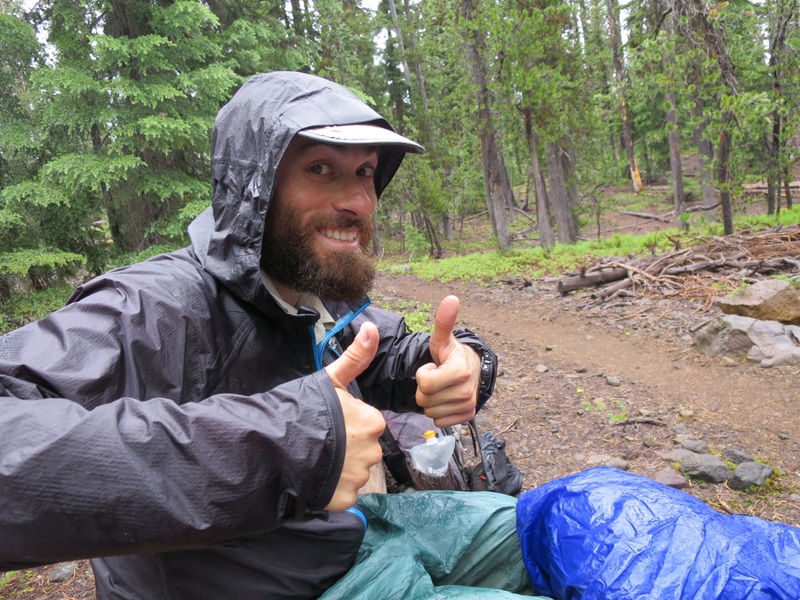 Andy recalls reading another hiker’s journal entry from a few years ago about how he almost had a meltdown in Oregon because of the mosquitoes. He now understands why. At one point Andy stopped to take a pee and had to use his other hand to create enough wind to keep the mozzies from biting his manhood. Around 4:20 pm we reached camp. Even here we had to climb over a few logs to get to the flat spots of ground. This was much earlier than when we usually stop but we were all tired and wet. It had been a long day. In 16 miles we had navigated over or under 309 downed trees! We quickly put up our tents and stripped out of our wet clothes. Andy stayed out to boil water for dinner and to drink. Cold days usually amount to us drinking less water and we hoped the warm water would entice us to drink more. Unfortunately Andy wasn’t very thirsty and Laurie didn’t want to drink much in fear of having to go into the mosquito war zone to pee. After dinner, as we were cozy in our tents, the skies let loose. It rained hard for almost an hour. “If this continues I’ll have to move my tent” Speed remarked as the rain pooled around his tent. Unfortunately we had similar issues. Water was pooling under the bottom half of our tent. When we put our hands down on the floor we created ripples. The floor under both of our air mattresses was sopping wet. Andy got out see if there were other spots we could move to, but no luck. Speed’s former spot was now a huge puddle of water and so were the other spots around ours. Andy dug a few channels to allow the water to escape from the bottom of the tent. Hopefully this works and it doesn’t rain too hard during the night. It could get ugly. We will find out in the morning. Now it is time to sleep. Tonight we are grateful for sections of clear trail and dry sleeping bags. Wow 309 trees! That sounds exhausting! I am glad the mozzies are keeping away from all your “bits and pieces” guys! I got a nasty mosquito bite on the 4th of July and my leg now looks like a candidate for amputation. 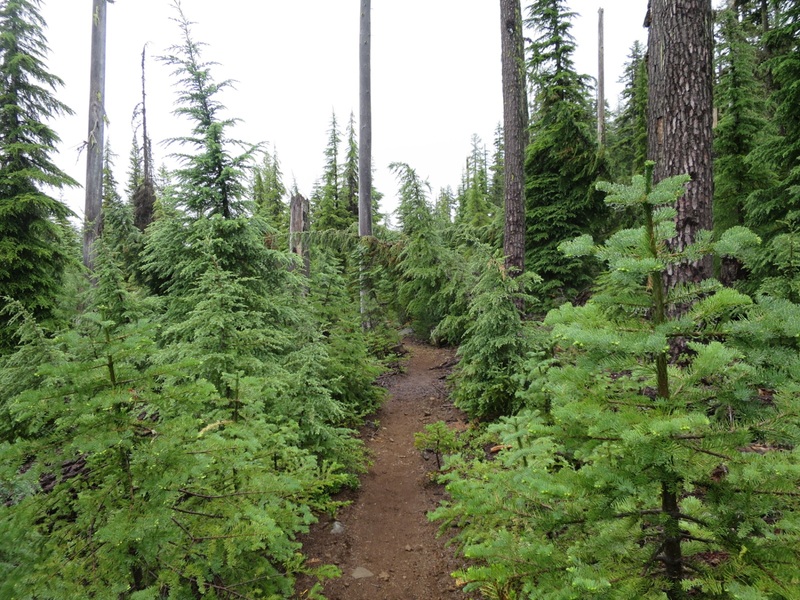 I love reading the blog and can’t wait to see crater lake, I’ve always wanted to go there. Good job guys! Thank you! The mosquitoes are pesky but we are okay when we are covered. Crater Lake was absolutely amazing. Definitely worth a trip! !